Discussion in 'Pro Evolution Soccer' started by ThomasGOAL, 25 May 2016.
you guys can stop it now! Just a quick comment on the menus. On the pitch it’s not 60fps, as I said. That’s sad. Before match it’s all good. But what I wanted to say: without the servers beeing online this game loads so fast into ML. It’s a joy!! Now let me be entertained by... yeah, me!! aka head coach of Stade de Reims!! R E I M S!! Get that in your heads people!! Madmac79, rockstrongo, papinho81 and 2 others like this. So I was tempted and continued my old save in superstar . I was with my fictional team which for some odd reason i started with defaults and finished 3rd and I continued from August of 2017. I had CL play-offs against Copenhagen.Returning after long time with 18&19, I played The first leg ,home match, two months ago and it was one of the greatest situations in terms of tension and drama ,I have ever had in PES. Open the match with an early 1-0 and decided to try to keep a low tempo and “lock” the score, so in the second leg all I had to do, would be a 0-1 and guard it up to 2-1, where I qualify due to away goals. But being away go to long and being unfamiliar with the fastest tempo of 17 I found myself loosing 1-4 in early second half.I really don’t remember again a game in 17 I conceded 4 goals!!! I went all-in-all attack, made 3 subs in 83’!. In 85 I did the 2-4. I thought it was completely lost in 90’ but with 4min extra time I achieved the 3-4 in 93’. Thank god it was not a 2019 referee , cause he would blow the final whistle from 89:55!!!! Chris Davies, Emroth and PRO_TOO like this. lovely story. i like those!! are you playing on regular speed? i turned it down to -2. even -1 seems a tad to fast for my liking. i only wish the animations (especially the ball-receiving ones) would be a little bit faster. i like the animations speed on -1 but the whole pace is suffering from it. so i choose the -2 speed for a more real experience overall and take the slowish ball-receiving animations that comes with it. we cant have it all, can we!? Rock told me to go -2, but for some reason I thought -1 has a bit more "punch" so I left it for a while. After few matches I changed it, as -2 feels much more realistic and doesnt feel sluggish, like -2 in newer versions. As for ball receiving - I recommend R2 button + direction for quicker ones. Works great, its much more useful and "visible" than in 18/19. Plus you might get a nice trick along with it. Thats how I scored that last goal I posted here - that was R2 receive. In general, all the tricks are much more fun and random in this version. Im getting some really nice animations from time to time, triggered by smallest things, like changing direction quickly or R1 double tap speed burst. I absolutely love them. Double tap speed burst is one of the most fun and effective ways to dribble there and it works much better than 18/19. Which option file are you using? I would like to play it but with updated teams. 1) I got the feeling that other speeds except for default are not so well optimized. They seem to work in a KONAMIsh way. I could see different speeds depending on the ground, the ligts (day/night) the weather etc. it seems weird for a console version but there are matches where the difference in -1 speed is chaotic, it can go from slowmotion to rocketfast from game to game. I mean in one match in -1, i feel like i play -2 in 29fps and the next match it goes like +3 60pfs! Dont know if it is only me, but at least with the default 0 i dont spot such differences that can annoy my controlling. 2) And since i play with PA1+basic, i prefer the 0 speed to add kind of a difficulty, in -1 although the ball goes more fast as it should the players move really slow and i have advantage cause i predict every body movement. So although the animations are faster and choppy and i loose in term of control,it forces me to think faster,so i add some extra difficulty to my self. So back to my story, two days ago i continued the second leg, which i postponed as much as i could , to get myself relative and competitive in 2017 again. In the second leg in Copenhag's home ground, we started needing a clear 0-2 due to 3-4. I did the 0-1 around 20 and they equalized around 30 1-1. This time the team reacted better and we did a great 1-3 in the first quarter of second half, finishing with a 1-4 in early 80's. I put the screenshot in the spoiler below. What i want to conclude is that, all this time with 19 and 18 i have forgotten how it is to play a much with so high tention. If you are a "scripting" believer or not, for me in the new games the most matches are too clear, crystal victory when the AI lets you, or dark defeat when the CPU momentum hits you. Even if we assume that 2017 is technologically is inferior than the latter versions (which is in some parts, while is superior in some other) it can serve this tention and drama. Mix the things and feelings so much, creating fascinating games where you need to come back, or get up on your feet after a huge slap etc. P.S.1: After reading your thoughts i may give a try to -2. 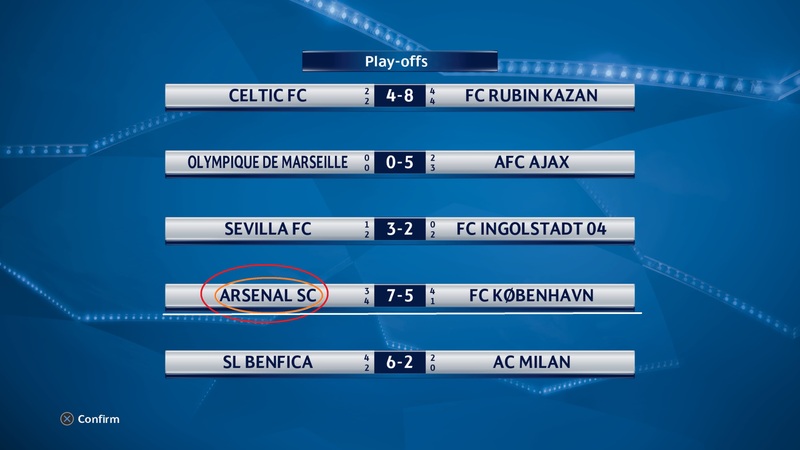 P.S.2: My fictional teams, since pes 2011 , is Arsenal SC (sports clubs) , It uses a recoloured Arsenal logo !!! I have creative problems, i am expert on recolour emblems and strips or create my own, but i cannot for the shake of god , all these last 10 years to create my own fictional team from scratch, can't even find a proper name!! Emroth and PRO_TOO like this. You talking to the elite here! Sure I’m using R2 when receiving the ball. At least the AI is doing the long animations too. Emroth and slamsoze like this. @slamsoze aaah... you do play on PA1. Then a faster pace might be fine. Full manual it gets to chaotic when I attack (on regular speed). I need time on the ball to look out for receivers of my awesome high pass game! I know, it would be a huge advantage in my favor, to lower the speed and keep PA1. I find it like cheating. Thats also possibly the reason why the crosses and headers look so OP for me, compared to you FuMa guys. Coming from Pes 18-19 and even Fifa i felt that -1 which I played probably 10+ seasons on it felt fast as hell. I even had a season on 0 game speed,helps with ball speed+animations being synced. We couldnt find up to date OF for 17. Most of us play with OF from back then. Ps. Its a bit strange, but even tho manual passing feels more assisted it also feels more rigit. You have less freedom on the ball and most manual passes seemed to be going off a bit for me. Even tho it was manual, I felt like there was a predetermined ball path for each pass. So, completely not like me, I settled on PA1 passing, and ADVANCED through balls, to add extra difficulty and to give me manual feeling in final third. That works fantastic so far. I can still have full control in around their penalty box and also take full benefit of L1 early crosses, which are absolutely amazing on Pes17. Ps. I agree about scripting, @slamsoze . Regardless if you believe in it or not, you could really feel it. Especially on 19. Whole 19 felt.... just fake. Pes17 is as unpredictable as it gets. You can win, lose and turn around every match. For the first time in 2 years I feel like Team Spirit works the way it should work. It just affects your player runs, not the outcome of the match. Yes sir. There are some things that make you wonder as the games progress like how they dumped down the AI so much in 2019 compared to last year or to a two years ago version. Furthermore in each game there are flaws, others are small other are big and gamebreaking. For example this year since the demo i was posting again and again how locked and rigid the movement is in 2019. Sure when you control the ball alone it seems more free and smooth, but inside a competitive match, the smoothness goes for a far trip leaving you only with 4 directions as a viable option of movement and dribbling. The same happened last year with an other flaw in 2018 for me. Since the online beta in PS4 i was posting and posting and repeating like a troll how bad is the body collisions physics compared to 2017. It makes completely not any sense, that a more modern and better technologically optimized game has such a downgrade in bodies physics, They turned bodies to marshmallows jelly gums!!! In the next post i will post you 3 videos, i promised a month ago , now i am uploading them speretally as i still luck a proper video editor, and i will show you how the collisions physics work in 2017 and a video i was lucky to capture in 2018 which summarizes all the body physics in 2018. After i re-watched them in my PC i really wondered how from a complicated physical system in 2017 they went to a non-physics game in 2018. Videos in the next post. Oh, man, dont even get me started on body collisions on 18. I HATED it. For most cases players were never falling. Just tripping. This players tripping was making me crazy. It was so unrealistic and so stupid looking. Back then I had facebook and I was going mad at them in every post about physicality , collisions and fouls. I only had to apologise to 18 when I came back this year and AI felt like it was miles ahead of 19. But that was only brief moment as shortly after people here recommended 17 and we know the rest. So here is the post i promised long ago. I really wonder, what developers would think if they compared the 3 videos about their work. How did they create something A+ in 2017 and they downgraded it to B- in 2018. What was the purpose? First video is an aerial duel in 2017 where the players collide in a very good "cause and effect" sequence. And third video, an aerial duel in 2018 (#NOT?) and a collision?? # Not_again!!!! pay attention , it is a more modern game and both players after jumping to challenge for the header, return magically to their initial positions, like nothing never happened!!! This video summarizes pretty much the 2018 lost physicality for me. incas36, papinho81, Madmac79 and 1 other person like this. reg. the second video: you might think its ok when you tackle the AI and not get booked! i hate it when the AI does it (that exact tackle wich IS A FOUL!!) to me and not get booked but instead get the ball! other than that: i agree with you to the fullest! 2017 has some nice physical battles. but, the collisions system in regards with the ref whristling for a foul isn't flawless in 2017. Yes this is true. Just wanted to mention the difference between one version and the not existence in the other. If we go deeper, yes the collision system suffered a lot this year compared to other previous version. The most noticable flaws are some non-calling fouls and some late-detection, where a body contact occurs and the result of the collision animations starts to play 1 or 2 seconds latter. In many occasions, i had goals canceled as offensive fouls, cause some CPu defender dropped on my leg or my body, after i took a shoot or a header, which in real football, is at best advantage and goal, or at worse defensive foul and penalty. But from developing POV this game and 18 are dead now, so they are as they are. Chris Davies and Emroth like this. yes!!! and/but the same time 2017 feature some nice advantage rule play. it is really crazy how this game has some stuff so well and others are not so good (really broken seems nothing to me, in 2017). we talking deep stuff here, as you said! it is really crazy how this game has some stuff so well and others are not so good (really broken seems nothing to me). And a joke coming in my mind now. Maybe KONAMI people thought: "Collisions seem sometimes a little bit miss-timed, let's remove them completely next year so they will be flawless! " Tell me something, @PRO_TOO - do you recon that referees in 17 are worse than in 19? Just pure curiosity, nothing more. Coz as much as you pointed referees in 17 out few times, I personally think in 19 they were much worse. The way AI can come through you like a S.W.A.T. team and its a free kick for them i will never understand. slamsoze and Chris Davies like this. hm... i said it before, the ref and the long ball receiving animations arent perfect but they are no game breaker to me. when i had to choose between 17 and 19 refs i think i would prefer the 17 refs! havent played 19 for some weeks now. saying that, the game gives me a lot of fun! i can kinda overlook that when i'm in the middle of the action! its just not perfect. but what is?! I think the refs are great in this game,I can play tough and nasty,if I cross the line it's a yellow (which I deserve,) or even red! Since I play fifa most of the time right now,I'm tired of soft red cards in that game. Some yellows become straight reds instead. Madmac79, Emroth and slamsoze like this. I want to add: My guts tell me, in 2017, the ref is having a lot of “one last warning” situations. I’m sure it’s a yellow (for me or AI) but hey... the ref is the boss. Wich brings back my wish for different refs with different strictness level (maybe even more detailed in what each of em does on the pitch)!! What about the side line ref? I would like to see the main ref talking to the side line guy to discuss stuff like “was it offside or not”! What about the 4th official holding up the over time clock?! What about refs checking shoes before we sub in players? ... I stop here. There is more in my head (I bet in all of our heads)!! Edit: imagine the ref is talking to the guy at the side line. And when you move your player next to them... they send you away to have a private discussion. And please let me have a yellow when I play foul and kick the ball away after the ref blew the whistle!! *Note to myself: don’t repeat yourself (that much)! ThanosMJ and slamsoze like this. So happy 17 is getting the love it deserves. You guys also nailed exactly one of the main reasons (probably the, main reason) why I loved 17 and was disappointed with 18. Football is a contact sport and in 17 with all those collisions you feel exactly like there is a physical battle going on most of times. While at the opposite 18 felt so "sterile" with that little duels..
although I still am not a fan of 18, anyway, I must say I did some friendlies on it recently just for the sake of it and IA is still much better than 19, with cpu being unfair but still way more varied, with outside shooting, dribblers actually dribbling and so on. If I'd ever feel like playing that kind of roguelike football, I think I'd prefer to retake this rather than 19. I also like it more graphically in some sense. rockstrongo, Emroth and slamsoze like this. although I still am not a fan of 18, anyway, I must say I did some friendlies on it recently just for the sake of it and IA is still much better than 19, with cpu being unfair but still way more varied, with outside shooting, dribblers actually dribbling and so on. Man, I was saying exactly that the other night. I didnt like 18 until i spent so much time on 19 and went back to it few months back. It only shows how bad 19 is this year! slamsoze and Madmac79 like this. I need your help hear, if anybody has the time and knows to search through edit mode. I have my game since then and I did the last DP update and LU which ruined much things. It seems I miss this player , who I was pretty sure was in game during sometime in 2017. I also miss Arteta. In the PC version when I started a 1.01 version without data packs he was there as Arsenal player and free agent, after the updates he went missing , he had a pretty scan face. What bothers me is, as far as I remember, that year they stopped vanishing players from database after updates and they started putting them in free agents. What you just want us to search for them? I'll check it in the evening as well. But since its not in rocks game i dont think it will be in mine. Thanks for help guys. Yes possibly taken or messed. Very strange cause since 17 they stopped removing playerss from database after updates. @Emroth basically R. Martinez. In your ML or in edit mode ,through advanced search you type “R. Martinez” but you input the special (I) the Spanish one., instead of the English one.